Klaus #2 is an absolutely joyful book, in the fullest sense of the word. It is full of depictions of merriment, particularly scenes of the pesant children, destitute and deprived, discovering to their delight piles of presents to play with. Dan Mora captures in their eyes that same twinkle which Moore attributed to Saint Nicholas. More over, the book itself is a constant source of merriment, produced in the readers’ hearts through such jestful scenes as Klaus using his signature sack, emptied of its precious parcels, to choke out and subdue a guardsman, or another in which he encases a cannibal’s unconscious corpse in a makeshift snowman, much to the horror of his compatriots. But it is also filled with joy in a more literal sense. Morrison takes pains to point out to the reader that the goatee graffitied upon the grinch-like Baron’s portrait is shaped as the rune for “joy.” And there is little doubt that Morrison is aware of the likely etymological relation of its synonym “jolly” to “Yule,” especially given that one precocious pauper refers to the mysterious benefactor as the Julernisse – the Yuletime Spirit (which I’ll have to steal for the name of an Eggnog cocktail). Not only is Klaus joyful and jolly, it’s jovial too, in the fullest sense of that word. Yes, such is a synonym with the first two, but it means so much more. Before men came to confuse solemness with somberness, jovial had connotations of magnanimity, of the husband of a house by his hearth heated, over his little realm a regal ruler, secure and serene and surrounded by family, Jupiter and the gods writ small. Jovial is Zeus taking pity on poor Prometheus, by adamant chained atop the mountain, producing from one link and a single stone the first ring, presenting to the prisoner a symbol of kingly charity and liberality. 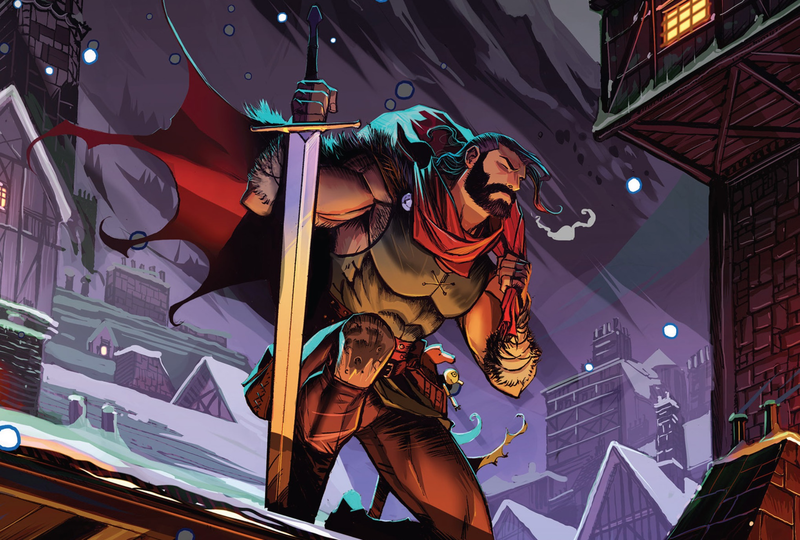 In reading Klaus #2, with its sword-wielding Santa bestowing truly magical gifts, I could not help but recall Father Christmas in The Lion, the Witch, and the Wardrobe, visiting Narnia for the first time in a hundred-year winter, distributing weaponry to the Pevensie children. It is an episode many readers regard as incongruous with the surrounding story. Yet Michael Ward in Planet Narnia realized it as the piece that made sense of the whole puzzle; Lewis had been enamored with medieval cosmology and the personalities assigned to the seven planetary spheres, corresponding each book in his eventual heptalogy to one of the heavenly host in structure and subject. Regarding himself as having been born under Jupiter (by disposition if not by date), his first work would of course be jovian, and as such only made sense to include a chapter at Christmas and to center the plot on kingship, good and bad. Likewise, it perfectly fits with the jovial tone of Klaus to have as its antagonist a maleficent monarch in Magnus. He is in many ways the White Witch, his hamlet of Grimsvig also “always winter and never Christmas,” so long as he has anything to say on the matter. Which he doesn’t, since in the issue Klaus schooled him on not bringing swords to a snowball fight. It’s a shame only the second of six issues is out. I’d have loved this wonderful series to have been finished by Christmas day. But even when the the Calvins of this world go back to pelting the Susie Derkins with snowballs indiscriminately, the fear of Santa’s reprisal far from their thoughts for eleven months more, my mind will still be squarely centered on Klaus, eagerly anticipating every issue. December 20, 2015 in Comic Books.